Christian Ludwig Gersten (1701-1762) (see biography of Christian Ludwig Gersten) was a good German scientist, professor of mathematics at the University of Gießen, primarily known by his book for a series of experiments, using the barometer. The interesting fact for us fact is, that in 1735 Gersten traveled to London, to be elected a fellow of the Royal Society and to present to the Society his project of arithmetical machine. In this description he claims, that this machine has been designed 12 or 13 years before, most probably in 1722. The machine was described in the Philosophical Transactions #438 for the months of July, August, and September 1735 (pages 79–97). 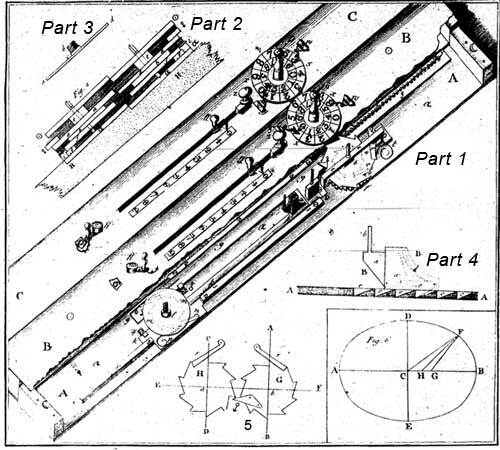 In his 19-pages detailed presentation, named Description and Use of an Arithmetical Machine... (see description of the machine of Gersten) Gersten mentioned, that he has been acquainted with the machines of Morland, Leibniz, Poleni and Leupold, and was inspired from them (especially from Leibniz) to create his own calculating device. 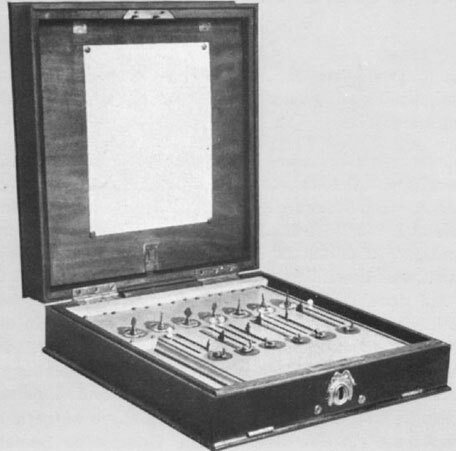 The first prototype of the machine was wooden, and after the device has been presented to the friends of Gersten, they encouraged him to continue the development. The second copy was made from brass and in the end of 1725 Gersten presented it to the Langraf of Hessen Darmstadt Ludwig V, who admired the inventor. Nothing more is known for the machine of Gersten. At the present day exists only a replica of the device from 1920, preserved in the Braunschweigisches Landesmuseum (see the upper figure). The dimensions of the machine are—36 cm width, 37 cm height, 7 cm thickness. It has 6 positional input mechanism and 7 positional display mechanism (from the design of the machine is evident, that it can be easily extended with additional positional modules). In the part 1 of the upper figure are shown the first 3 digital positions—for units (marked with AA), for tens (marked with BB), and for hundreds (CC). Every position has 2 sliders, first of them (the upper one) Gersten named operator, the second one—determinator. The determinator indicates what number will be entered in the calculating mechanism, while the entering is done by moving the operator. The main element in the calculating mechanism in the machine are ratched-wheels. They are used in the digital dials for entering of the numbers, and for tens carry during the calculations. At the end of his presentation, the inventor acknowledged, that the major constructive problem of the machine is significant friction between the parts of the mechanism, when must be done tens carry for two or more digital positions. 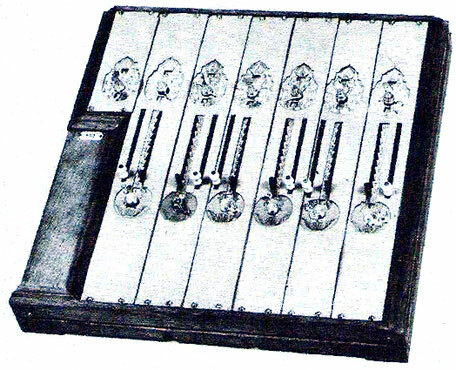 The machine of Gersten is not so elaborate and easy for operation, as the machines of the other early inventors, but nevertheless it is a well designed and fully capable for calculations device.